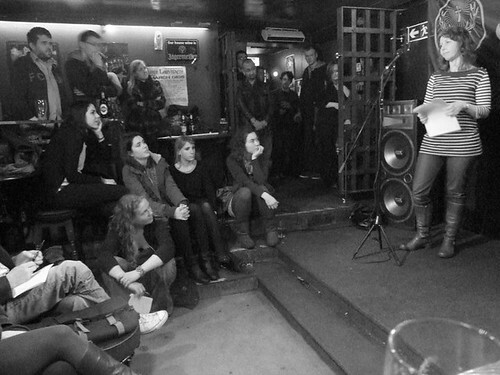 Shore Poets NOVEMBER: Quiet Slam! As promised in our last blog update, we’re mixing it up this month… doing something we’ve never attempted before! That’s right – we’re slamming! For the first time ever, we’re hosting our very own (quiet) poetry slam, especially for Book Week Scotland 2014. Ten poets will compete: six of them will be poets featured in Be The First To Like This, the brand new, very exciting poetry anthology from Vagabond Voices. The other four slam slots are open to anyone, and successful slammers’ names will be picked from a hat on the night! Prizes up for grabs include book tokens, poetry books and CDs, and our overall winner will progress to the Scottish Slam Championship finals! October already! Time for woolly scarves and pumpkin-spice flavoured everything, including – I am not making this up; they exist at Trader Joe’s – pumpkin-spice flavoured pumpkin seeds. Whether Henderson’s @ St. John’s has pumpkin-spiced cake, I do not know, but they definitely have warming treats so you can enjoy those during our October event. REMEMBER THE CLOCKS GO BACK THAT WEEKEND! Our headline poets are two honorary Shore Poets: Brian Johnstone and Ken Cockburn. Brian Johnstone has published six collections, most recently Dry Stone Work (Arc Publications 2014). His poems have been translated into over ten languages; in 2009, Terra Incognita, a chapbook in Italian translation, was published by L’Officina (Vicenza). A founder and former Director of StAnza: Scotland’s International Poetry Festival, he has appeared at numerous international poetry festivals, from Macedonia to Nicaragua, and venues across the UK. (In fact, as of the time this blog entry was being written, Brian was appearing at a festival in Canada!) He will be reading from his most recent book, as well as a few favourites from previous publications, with his poems ranging over subjects from travels in Greece to Scottish history, from life in the circus to cartoon characters, from 40s jazz stars to 60s pop groups. Ken Cockburn was born in Kirkcaldy. He studied French and German at Aberdeen University, and Theatre Studies at University College Cardiff. From 1996 to 2004 he worked at the Scottish Poetry Library, as Fieldworker and Assistant Director. With Alec Finlay he established and ran pocketbooks, an award-winning series of books of poetry and visual art (1999-2002), and was subsequently a director of platform projects, its successor company. Since 2004 he has worked as a freelance writer, translator, editor and writing tutor. His first collection of poems, Souvenirs and Homelands, was shortlisted for a Saltire Award in 1998, and a collection of his translations of contemporary German poets, Feathers and Lime, was published in 2007, as was a new collection of poems, On the flyleaf. His poems have been published in translation in French, German, Hungarian and Slovakian. Both Brian and Ken have pages on the Scottish Poetry Library website, where you can find more information and links to their poems. Our new poet is Lindsay Macgregor. Lindsay is co-founder and co-host of Platform poetry and music nights at Ladybank Station in Fife. She writes online poetry reviews for Dundee University Review of the Arts and co-edits Dundee Writes, a small magazine of prose and poetry by students and staff from across the University of Dundee. Her poems have been published in Northwords Now, Gutter, New Writing Scotland, Poetry Scotland, Ink, Sweat and Tears and New Writing Dundee. She is currently working on a text and image collaboration with Sutherland artist Merran Gunn. Our Shore Poet is Angela McSeveney. Angela’s first collection of poems, Coming Out With It, was published in 1992, after she received advice and encouragement from fellow writers Liz Lochhead and Ron Butlin. She has since published three pamphlets, the most recent of which, Still Bristling, was published by Mariscat Press in 2012. Our live musicians are traditional musicians Ros, Roy & Corinne. And who will be our wildcard poet? Maybe you! Just bring a poem you’d like to perform, put your name in the hat when you arrive at the door, and wait breathlessly to see if your name is picked!